Tamaki♥Haruhi চুম্বন. Tamaki and Haruhi's চুম্বন in the জাপানি কমিকস মাঙ্গা :). HD Wallpaper and background images in the ঔরান হাইস্কুল হোস্ট ক্লাব club tagged: host club ouran screencap tamaki haruhi kiss. OMG I JUST.... I JUST <33333 I LOVE TAMAHARU!!!! I asked my mom to get me OHSHC Manga for christmas. haruhi and tamaki make a cute couple. 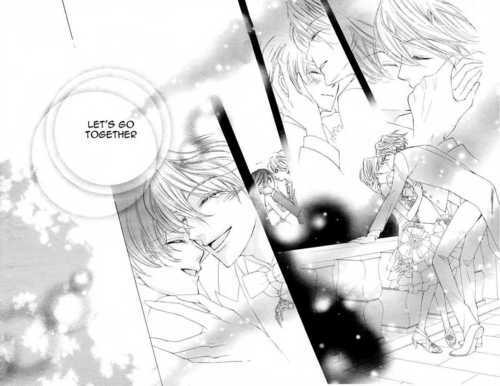 i really like at the end of the volume, haruhi was shown in a wedding dress and tamaki was carrying her. it looked beautiful and the art was amazing. I WISH I WAS HARUHI!!!!! !